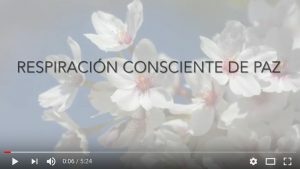 A new video with an easy guidance to Peaceful Conscious Breathing is now available on our YouTube channel… both English and Spanish versions. Click on the following link for the English version or the Spanish version. Let yourself be guided and inspired by the technique itself and by the variety of examples suggested in the video, feel free to explore and feel for yourself how much you can harmonize breath and thought, in daily life and situations, with this simple, powerful and practical technique.